Considered by many to be one of the best British films ever made, The Life and Death of Colonel Blimp (1943) is undeniably Michael Powell and Emeric Pressburger’s masterpiece – a sprawling epic that spans four decades, from the Boer War through World War I with General Clive Candy (Livesey) as its focus. 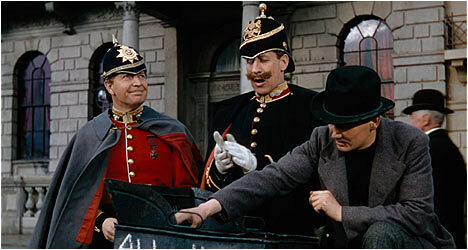 At the time of its release, Colonel Blimp flew in the face of the prevailing trend of social realism with its numerous tonal shifts and use of vibrant color. It was also a politically subversive film – a rarity at a time when most British films were incredibly patriotic, to the point of being propaganda. Powell and Pressburger’s film took an ambivalent stance on war and questioned the principle of fairy play, which didn’t sit well with Winston Churchill who tried to have it suppressed. Thankfully, this didn’t happen and Colonel Blimp has gone on to become regarded as one of the very best films Britain has ever produced. The Life and Death of Colonel Blimp starts off as a rousing war movie complete with playful music as a platoon of British soldiers seek out General Candy in a bath house for a code to engage the enemy before the agreed upon time during World War II. He can’t believe that they want to start things early and the scrappy veteran starts a fight with the platoon leader. This segues into a flashback as we meet a significantly older Colonel Candy. England is mired to the Boer War and Candy sneaks off to Berlin to confront a man spreading gossip that the British are mistreating women and children in South Africa. Once there, he meets a beautiful governess named Edith Hunter (Kerr) who tipped him off in the first place. After insulting a German officer, Candy is challenged to a duel where he faces off against Theo Kretschnar-Schuldorff (Walbrook). In an audacious move, we never see its outcome, but they both survive (barely) and become life-long friends. The Life and Death of Colonel Blimp is an ambitious epic with Deborah Kerr playing three different characters that weave in and out of Candy’s life at various crucial points. Her characters form a love triangle between Candy and Kretschnar-Schuldorff. The production is marked by a lavish attention to period detail, including impressive art direction and costume design. Powell and Pressburger’s film never quite connected with filmgoers on a mainstream level as it was released sporadically over the years and in a significantly truncated form in North America. Martin Scorsese saw it at a young, impressionable age and became an important champion of it. So much so, that he spearheaded a restoration so that everyone could see The Life and Death of Colonel Blimp as Powell and Pressburger had originally intended. The first disc features an audio commentary by director Michael Powell and Martin Scorsese. The latter talks about when he first saw the film and what drew him to it. He mentions the various running lengths and why it took him years to track down a complete print. Powell soon joins Scorsese and takes us through the making of The Life and Death of Colonel Blimp. The second disc starts off with an “Introduction by Martin Scorsese.” He provides some backstory to the film, like how Powell and Pressburger originally wanted Laurence Olivier to play Candy. He talks about the various running lengths and speaks admiringly of what he likes about it. Most of this material repeats what was covered in the commentary. “A Profile of The Life and Death of Colonel Blimp” is a 24-minute retrospective documentary on the making of the film. Producer Kevin Macdonald, actor Stephen Fry and film critic Ian Christie all talk about what makes it such a great film. This featurette takes us through the production and addresses the controversy that embroiled it back in the day. Also included is a “Restoration Demonstration,” which sees Scorsese return to take us through the film’s 2012 digital restoration. He explains the process with before and after clips. It is quite impressive to see just how much work went into cleaning up this classic film. “Optimism and Sheer Will” features film editor Thelma Schoonmaker talking about the film and the career of her late husband Michael Powell. She talks about what makes the film so great. There is a “Stills Gallery” of production photographs and behind-the-scenes stills. Finally, there is “David Low’s Colonel Blimp,” a gallery of photos of David Low, the political cartoonist that created the cartoon of Colonel Blimp, which inspired the film. Also included is a collection of his satirical cartoons.